Before I share the exciting side of my design ideas for the nursery, I first have to tackle the far less exciting side that is the spare bedroom as it is now and getting it from this point to an empty room. Sounds easy? It’s not as straight forward as I’d like it to be thanks to us being renters living with our landlords furniture and not having as much freedom as a homeowner would have. But I’ve successfully managed to come up with a solution to almost every problem. 1. 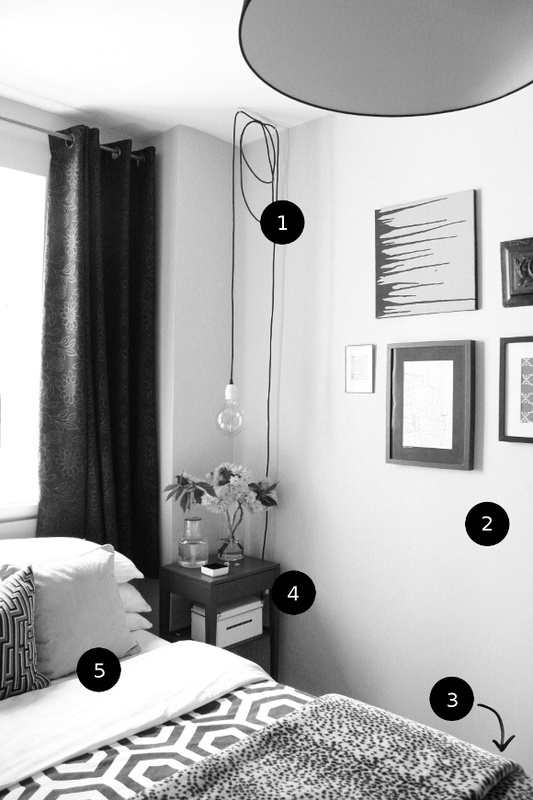 DOWN WITH THIS SORT OF THING – and everything else on the walls. I’ve found so many cute things to hang up and have some fun ideas, but that can’t start until I repaint. 2. REPAINT – this is an obvious step but it’s something that needs to be done before I start working on the nursery. I just need to decide on a colour. 4. DECLUTTER – I’ll be doing another sweep of what we have at the moment and either selling or donating as much as I can. I’ve gotten rid of a lot over the past two years but thanks to nesting hormones, I want to get rid of everything unnecessary. 5. DISASSEMBLE THE SPARE BED – since we’re renters and the bed in the spare bedroom is our landlord’s, we can’t get rid of it. My plan is to stack the spare mattress on top of the mattress in our bedroom, disassemble the spare bed and store it under our bed. I also have to relocate the college work and shelves that are currently under the spare bed to under our bed and hope it all fits. 6. 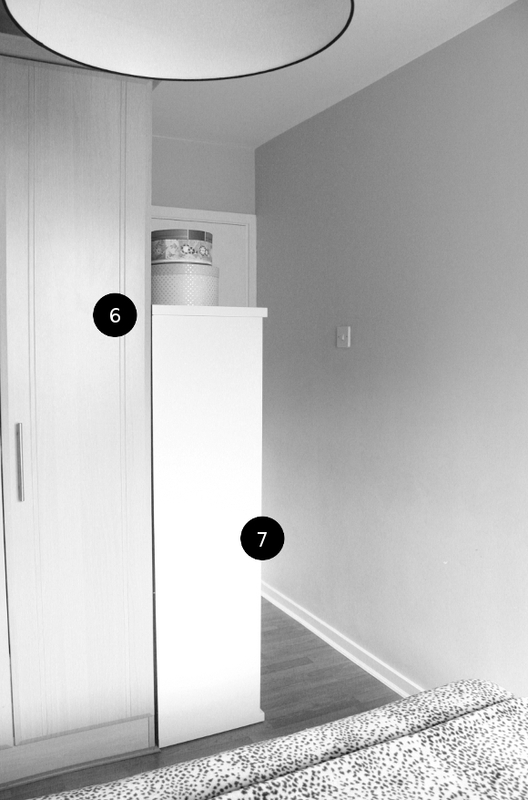 CHAOTIC CUPBOARDS – possibly scarier than under the bed; the cupboards in our spare bedroom. They hold about half of everything we own. Our Christmas decorations, more college work, my wedding dress, a printer, our landlords artwork, old Playstations, summer / winter clothes, one hundred years of wrapping paper that’s too pretty to use and mementos to name a few. All have to be ruthlessly culled. 7. MOAR SHELVES – this random set of shelves belongs to our landlord and sit awkwardly at the entrance to our spare bedroom creating a bottle-neck to the room [which will be v. awkward when bebe comes]. We keep our DVD collection on them at the moment, but I’m hoping to move the DVDs elsewhere and put these shelves within the cupboard [no. 6 above] so the shelves can house overflow bebe stuff that we won’t have room for in the room itself. If you’ve read this far, I commend you! If you haven’t, I don’t blame you. That’s the plan I have so far to get the spare bedroom ready for its new design and subsequently, new occupant. I cannot wait to share the plans I have for the nursery! Not to mention get started on decluttering and organising and assembling tiny bebe things. I don’t take many selfies but I figure one day I’ll want to look back at pictures of me with a belly, so I’m trying to be less awkward about it. I’m 22 weeks today which means I’m more than half way through my pregnancy (WTF). We’re going to have to become adults in T minus 18 weeks, I need to invest in maternity clothes (officially can no longer squeeze into my normal tights and skirts), bebe is almost as long as a ruler (but rolled up), they weigh a pound, are getting a lot stronger and kicking hard enough that Robert can feel it. Bebe has also located my bladder and that is a whole ‘nother level of strange. Oh I hear ya, that's what our spare bedroom has been used for for … close to 8 years. I managed to do some serious decluttering and organising in the cupboards last weekend and I think I've gotten rid of or recycled at least 50% of what we had! It's mad how much we've been hoarding. I am proof that you can do it Kimberly! If it's not adding to your life, subtract it! I think your idea to stack mattress on mattress is kinda brilliant. What else are you gonna do with it. So smart! As for your awkward selfie… holy crap is that ever a perfect pregnancy photo. SOOOOO awesome. You look beautiful and happy. The shirt is the perfect for your new maternal shape. Just steller. Ah you're too sweet Pat! I think I'm bigger since this photo (which was taken 2 weeks ago) and I think I'm officially waddling now. Oh yeah, Robert sang our wedding song to the baby the other day ('Baby I Love You' by the Ramones) and I had the biggest ugly crying face. Hormones. Oh, the hormones. OMG. Yes, I had forgotten about the hormones. I get weepy still, but only if I am super tired. It is my new reality, I guess. So much for you to look forward to, Alex (insert sarcasm here). This is exciting!!! Decluttering and organising and changing! I can't wait to see part 2 to find out what your plans are – it's going to be exciting to see the transformation! Oh Maria there's so much organising and decluttering! It's been SO SATISFYING (this is the height of my excitement level now that I can't booze or go on trampolines). We're slowly getting there; one gorgeously organised box at a time.